Blochsox were designed to enhance your contemporary dance training by providing you with a variety of enhanced features that will make you never want to wear regular socks for training, ever again. A specially designed spin-spot features extra padding to protect your bones, while the interior of the sock has been engineered with sticky ﬁbers to keep the sock in place on your foot. Dansox provide stability when you want it and allow you to turn. These socks have been engineered to hold their shape better than regular socks. A padded heel, compression arch, as well as the ability to wear these socks with your street shoes to the studio, make this the most high tech dance sock on the market. 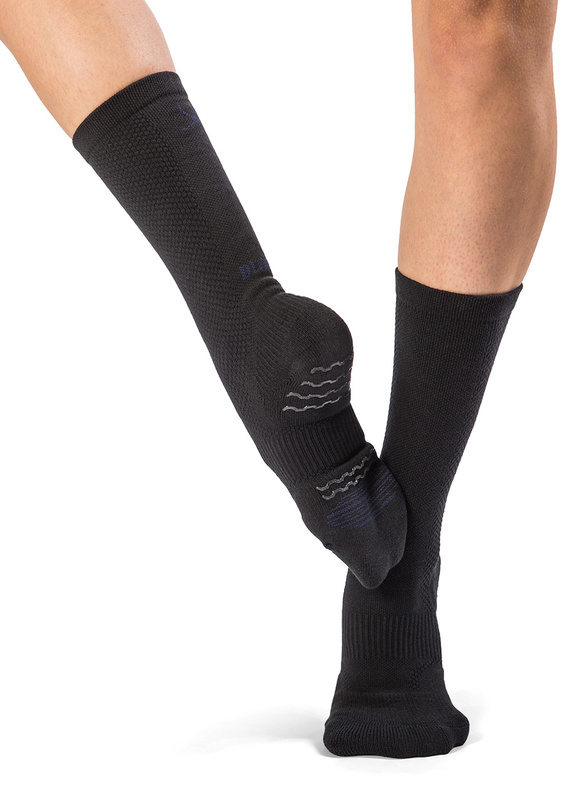 The built-in spin-spot has been designed to allow you turn smoothly, protect your bones, and also has sticky ﬁbers on the inside to hold the sock ﬁrmly against your foot. Special control lines have been added to target areas of the outside of Dansox that give you complete control of your dance routine. Lycra Spandex materials adds stretch and compression throughout the socks for a natural ﬁt. Dansox have been designed with a compression arch to hug your foot the entire time, giving you clean lines and supporting your foot leaving you feeling more energized.